The 2018 Baton Rouge Blues Festival commemorative poster, featuring artwork by John K. Lawson, will spotlight living legend and long-time festival performer Henry Gray. 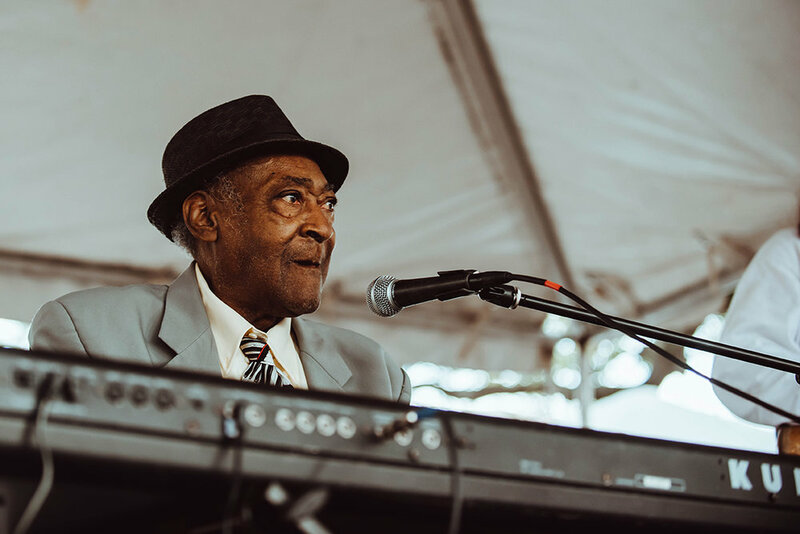 Blues legend Henry Gray began his career playing piano in an Alsen, Louisiana church at the age of eight and has yet to slow down. After serving in World War II, Gray moved to Chicago where he played and recorded with notable players and blues innovators for 22 years before joining Howlin' Wolf's band in 1956. Since returning to Baton Rouge in 1968, Gray has worked with an extensive list of blues notables such as Muddy Waters and BB King, has performed all over the world and has been honored with several award nominations including a Grammy nod for his work on "A Tribute to Howlin' Wolf." At 93, he will make his 20th appearance on the festival stage. “As a true patriarch of Baton Rouge swamp blues, we felt it was only natural to honor Henry’s lifelong dedication and passion for our musical heritage,” says festival chairman Chris Brooks. Artist John K. Lawson has his own unique relationship to the Baton Rouge blues scene, making his work a perfect fit to pay homage to these iconic musicians. After coming to the city as an LSU student 35 years ago, he immersed himself in the local music scene through Tabby’s Blues Box. Through the club’s namesake Tabby Thomas, Lawson discovered the Louisiana Swamp Blues and spent many late nights listening and cutting up with Silas Hogan, Arthur “Guitar” Kelly and Henry Gray, among others. In commissioning Lawson to create a portrait of Gray for the 2018 poster, the artist believes everything has come full circle and has created a full body of work focusing on Louisiana blues musicians. Using his collage technique, which itself mirrors the collage of sounds in the blues, he can now honor these men who gave him so much inspiration as a young artist and who continue to live on in his own work. “I’m a Free Hearted Man,” the title inspired by a Silas Hogan song, is a series of 10 portraits, including Lazy Lester, Tabby Thomas, Silas Hogan, Lightnin’ Slim and Arthur Guitar Kelly. The exhibition will be on display at Ann Connelly Fine Art from April 1–18, 2018. The Baton Rouge Blues Foundation will partner with Ann Connelly Fine Art for its annual Listening Party in conjunction with a reception for the gallery exhibit showcasing Lawson’s series. The original artwork inspiring the poster will be on display and available for purchase. The event will be held from 6–8 p.m. on April 5 with a special performance from Henry Gray. Commemorative posters will also be available for purchase at the Listening Party.